GN #3261 during Wooden Car Weekend,, August 18, 2002. Bill Buhrmaster photo. Great Northern coach #3261 (originally numbered #271 from 1906 until 1908) was built by the Barney & Smith Car Co. of Dayton, Ohio in 1906. There were fifteen identical coaches included in the order (numbered 260-274). 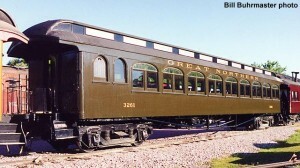 The coaches were purchased for use on the Great Northern’s St. Paul, Minneapolis to Hutchinson, Minnesota branch that served the resort areas along the north shore of Lake Minnetonka. Along the line, at Minnetonka Beach, the Great Northern owned and operated the swank Hotel Lafayette (originally built in the early 1880’s, later the Lafayette Club). The Hotel was a fifth of a mile in length and had facilities for billiards, tennis, croquet, fishing, sailing and bathing. Service to the resort area was provided by as many as eight trains per day from Minneapolis. #3261, February 1995. Paul Swanson photo. In 1922 fire destroyed the Lafayette Club and soon followed decreases in service and increasing fares. In October 1926, coach #3261, along with eight other “Lake” coaches, were taken out of passenger service and converted into stockmen’s coaches. Stockmen’s cars provided sleeping accommodations for the ranchers traveling with their livestock on stock trains. 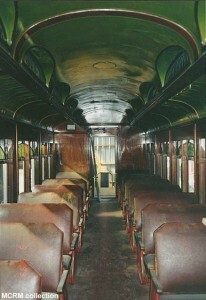 As a stockmen coach the car was renumbered to X791, seats and stained glass windows were removed, and bunks were installed. In 1928, a steel underframe was applied to the X791 to better suit the car for use in freight trains. The X791 remained in use as a stockmen’s coach, until 1969. The GN donated X791 to Mid-Continent in 1969 and shipped it from St. Cloud, Minnesota to the museum at North Freedom. The car was restored to its passenger coach configuration and original number of 271 in 1972 and served in train service. In 1990 it was removed from service due to a leaking roof and placed in the car shop for a much needed exterior restoration. The work included all new custom-made poplar siding and trim. 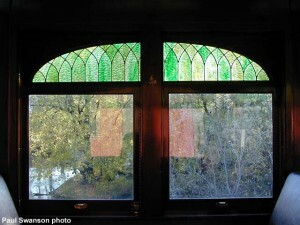 Most notably, the stained glass windows that were removed from the car some sixty years prior, were reproduced to recapture the car’s 1908-1926 appearance. Through the efforts of many volunteer hours, the coach once again provides “Lake” service, as the #3261 rides the Mid-Continent rails to Quartzite Lake during special events. GN 271 before restoration, c.1990. Paul Swanson photo. The interior of the #3261 is finished in mahogany with numerous floral designs inlayed into the varnished panels. Stained glass windows span each pair of window sash and stained glass clerestory windows provide ventilation and lighting for the car. As #X791 in GN drovers service, no date. #3261 stained glass window, 10-13-00. Paul Swanson photo. The Barney & Smith Car Co. had its beginnings in Dayton, Ohio in 1849. The company grew to be a major supplier of freight and passenger cars in the later half of the 19th century. Produced were many exquisite passenger cars in this time frame and records indicate that the prices were commensurate with the quality of the cars. The consolidations of many of the independent car builders and Barney & Smith’s inability to successfully compete in the profitable steel car market forced the closing of the works in 1922.